Building a new backyard shed is a fairly simple, cost-effective way to ensure your storage needs are met. However, before you actually start building, you’ll first need to ensure that the shed has a proper foundation. A foundation is an essential part of most any building, even if it’s something as small as a garden or tool shed. That being said, the low weight and height of most sheds mean that you can get away with a much smaller or less advanced type of foundation than you could if you were building a house or office building. In fact, you have a number of different options when building a shed foundation depending on the size of the structure and where you plan on building it. In some cases, it may be as simple as spreading a bit of gravel, while other situations will require you to put in quite a bit more time and effort to provide the shed with a solid, level base to stand on. Does My Shed Really Need a Foundation? 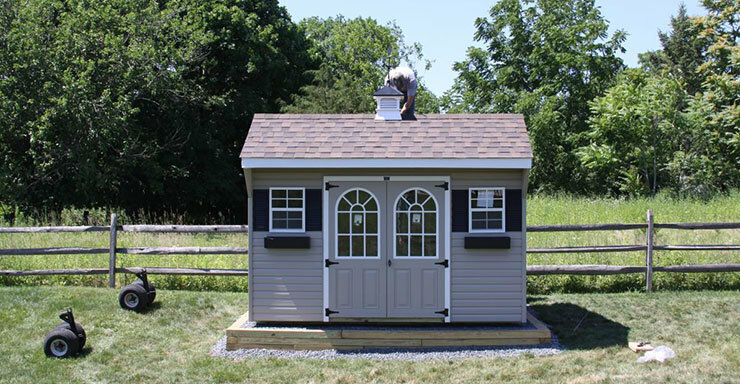 Even if the local building codes don’t require it, it’s always important that any shed is built on a sturdy, level foundation. Sheds built directly on the ground tend to quickly fall apart as water soaks into the boards and causes them to rot. Building a shed on the ground that’s not fully level will not only make the entire task a heck of a lot more difficult but also make the shed much less sturdy and more prone to collapsing or being blown over. Both of these problems can easily be solved by even the simplest type of foundation. Another reason foundations are necessary is weight. A properly built foundation helps prevent the building from sinking into the ground, which can cause it to lean or topple over entirely. You only need to look at the Leaning Tower of Pisa, with its ridiculously inadequate three-foot-deep foundation, to see what can happen when a structure doesn’t have an appropriately designed foundation that can support its weight. Of course, you’re not building a tower, but you can still learn from the Pisa architect’s mistake. This means making sure you fully consider the location, size, and weight of your shed to ensure you choose an adequate foundation to support it. The simplest type of shed foundation, this usually consists of piers of cement blocks placed anywhere from 2 to 5 feet apart. The shed is then built or placed over the top so that it spans the piers. Block foundations are usually best for areas where the ground is already level and only for structures that won’t hold much weight. If you’re looking for somewhere to park vehicles or heavy equipment, laying down a layer of gravel is a great choice. With a gravel pad, the shed’s skids are always in contact with the ground, which allows the structure to bear much more weight. You can also use additional gravel to level out the ground as needed. Similar to gravel pads, concrete pads are great at bearing heavy loads. Although more expensive and time-consuming, a concrete pad provides a permanent, solid, level base that allows even taller or heavier structures to stand strong for decades. However, you’ll want to make sure water doesn’t pool up on the pad as this can cause the skids to rot quicker. You can easily prevent this by pouring the pad so that it’s the same size as the shed to ensure that any water runs off onto the ground instead of onto the pad. In cases where the ground has a huge slope, building a post-and-beam foundation is generally a much more affordable alternative to excavation. This type of foundation uses pressure-treated posts buried deep in the ground. Pressure-treated beams are then fastened to the posts to create a solid, level platform for the shed. This type of foundation is essentially the same as the post-and-beam, except it uses concrete piers instead of lumber posts. The piers are built by digging or drilling deep holes in the ground. Special tubes are then put into the holes and filled with concrete, creating a more permanent base for the pressure-treated beams to sit on. The concrete piers also allow the shed to bear more weight, although still not as much as a solid concrete pad. As you can see, you have a variety of different options depending on how you plan on using your shed and how level the ground is where you plan on building it. There’s no reason to waste your time, money and effort building a shed if it’s not going to last. So, do yourself a favor and put a bit of thought into choosing the right foundation, as this will ensure you can enjoy the benefits of your new shed for years to come.